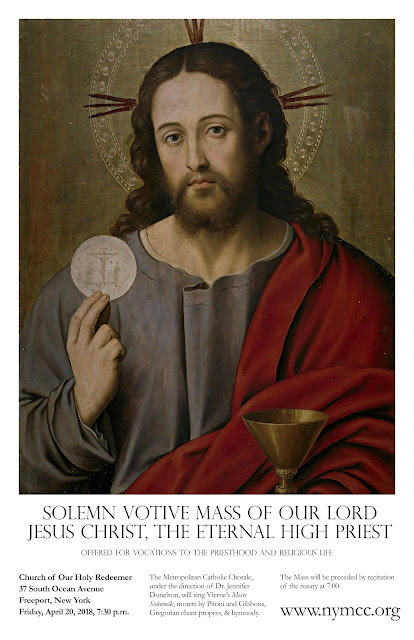 Solemn Votive Mass of Our Lord Jesus Christ, the Eternal High Priest, offered for vocations to the priesthood and religious life. The Metropolitan Catholic Chorale, under the direction of Dr. Jennifer Donelson, will sing Vierne’s Messe Solennelle, motets by Pitoni and Gibbons, Gregorian chant propers, & hymnody. The Mass, in the Ordinary Form of the Roman rite, will be preceded by recitation of the rosary at 7:00.